IISD-ELA highly values the engagement of young people and local communities in freshwater science. The unique nature of the IISD-ELA facility and our whole-ecosystem approach to freshwater science provides an opportunity to deliver a different kind of educational programming and community outreach for a wide variety of audiences. IISD-ELA aims to inspire and train the general public and the next generation of research scientists, providing a platform for science education and innovation. 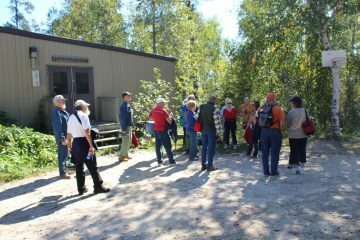 We are a committed member of both the Northwestern Ontario and Manitoba communities and are happy to facilitate tours or participate in outreach events with community members and schools in these areas. Every year we host an open house, welcoming individuals to the facility. The open house rotates between Kenora and Dryden annually, and in 2016 we are looking forward to welcoming residents from the Kenora area. We are striving to meet the needs of our local communities and the general public and are working on communication and educational resources on our freshwater science that can be used by teachers or the general public.